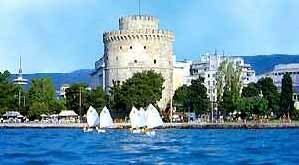 Thessaloniki, Thesaloniki, Salonika, Salonica, Macedonia, Makedonia, Greece travel & tourism, Greek islands travel. Thessaloniki: The second largest city in Greece with a population of 1,000,000 inhabitants, is one of the oldest cities in Europe. 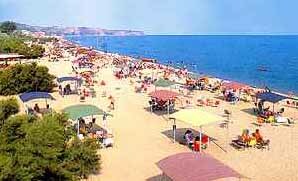 It stretches over twelve kilometers in a bowl formed by low hills facing a bay that opens into the Gulf Thermaikos. It was founded about 315 B.C., on a site of old prehistoric settlements going back to 2300 B.C., by Cassander, King of Macedonia, and was named after his wife, Thessaloniki, sister of Alexander The Great. Since then, Thessaloniki has become the chief city of Macedonia and its most important commercial port. In Roman times it was visited by Saint Paul, who preached the new religion, and who later addressed his two well-known epistles (the oldest written documents of Christian literature) to the Christians of Thessaloniki. The Emperor Galerius made it the imperial capital of the eastern half of the Roman Empire. Thessaloniki later flourished as a Byzantine cultural and spiritual center, second only to Constantinople. During Ottoman rule, Thessaloniki became a stronghold for the Greek School - a national underground effort to maintain the survival of Greek language and literature. Home to two universities, one of the best archaeological museums in Greece and numerous galleries and cultural organizations, Thessaloniki still serves as an academic and cultural center for northern Greece today. Today, Thessaloniki is a cosmopolitan northern city, but those who do find an intriguing blend of sophisticated shops and cafes, tree-lined avenues, winding castle-bound streets, Byzantine churches and Roman ruins. From Thessaloniki, travelers can explore Macedonia, the former stomping ground of Alexander the Great: take an easy day trip to the ruins of ancient Pella; visit the monastic community of Mt. Athos (for men only); or venture to the seldom-touristed Lake District, tucked against Albania's border, for vistas that rival the Swiss Alps. 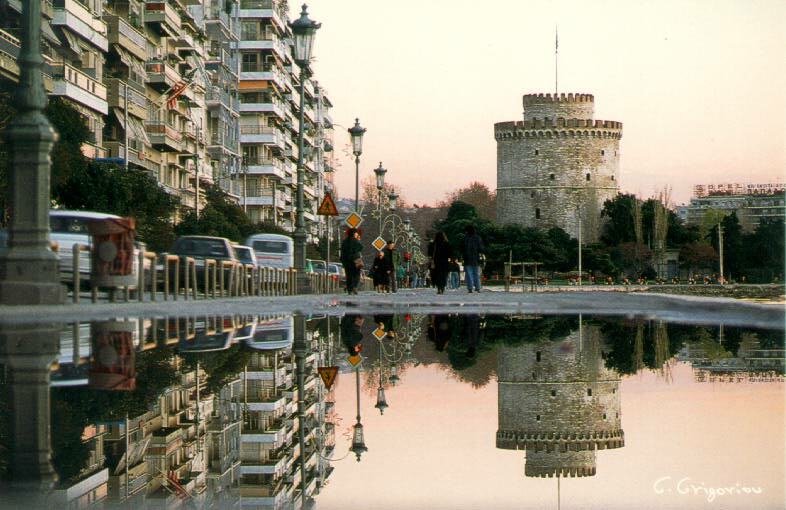 Thessaloniki is a thriving city and one of the most important trade and communications centres in the Mediterranean. This is evident from its financial and commercial activities, its port with its special Free Zone, which provides facilities to the other Balkan countries, its international airport, its important industrial complex, its annual International Trade Fair, etc. The city was the "Cultural Capital of Europe for the year of 1997" and they (and country for that matter) were very proud of the designation. 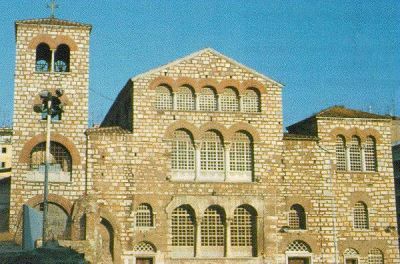 You can start your visit of Thessaloniki with a visit to one of the numerous historic churches, of which quite a number are now represented online. Try the Church of Saint Demetrios, especially the Crypt of Saint Demetrios in the bottom of the building. If you really like the Byzantine sites, try any number of these: Church of Saint Panteleimon, Church of Prophet Elijah, Church of St. Nicholas Orphanos, The Church of Acheiropoietos, Church of Agioi Apostoloi (the Holy Apostles), Church of Our Lady of the Coppersmiths, Church of Agia Sophia. There is also a Byzantine museum in The White Tower, which is the landmark of the city and is found on most Salonika motifs. Construction is still underway at the massive new Museum of Byzantine Civilization, but you can still visit part of the building, where exhibitions are open. If you prefer the Classical Greek, Hellenistic, or Roman periods, take heart, there's plenty to see here. First you can stop by the excellent Archaeological Museum of Thessalonika. It is the second best in the country behind the NAM in Athens. You can also walk around the theater and the Ancient Forum, currently under excavation, which is right in the heart of the city. You can't miss the city walls (well preserved), the huge Arch of Galerius, built in 305 A.D., and the Mausoleum of Galerian, once a church, then a mosque (with minaret), then a church, then a Byzantine museum, and now undergoing reconstruction after earthquakes in the 1970's. It's also known generally as the Rotunda. >> Macedonia : Drama, Florina, Grevena, Halkidiki, Imathia, Kastoria, Kavala, Kilkis, Kozani, Pella, Pieria, Serres, Thassos Island, Thessaloniki. Holidays in Greece, Greece Tourism, Greece Vacation. Ιt is the cosmopolitan center of the Cyclades Complex. Its reputation has spread during the last years due to its unique landscape, its archaelogical sites, its cosmopolitan environment and its magnificent beaches. White-washed, cube-shaped houses are scattered all over the island, narrow streets in the town, chapels and picturesque tavernas hide among art galleries and stores selling jewellery, souvenirs etc. Trends that sweep through the international scene are born in the intense nightlife of this modern resort. An island of tempting and tempestuous reputation such as Mykonos, with high tourism and a rather superficial lifestyle, inevitably has both fans and critics. But even the most unsuspecting visitor immediately realizes that Mykonos is not only a crazy “bon-viveur”, but also an attractive, picturesque island with white Chora aside the crystal-clear blue waters of the Aegean Sea. Direct international charter flights and regular domestic flights from Athens serve frequently, during summer, the airport of Mykonos. Because it is so famous, Mykonos gets really overcrowded during high season but for those who enjoy the crowd, great fun and all night long entertainment, Mykonos is the ideal place for holidays.